Next time the sun is shining and the weather is warm, consider mini golf to make a memorable day. 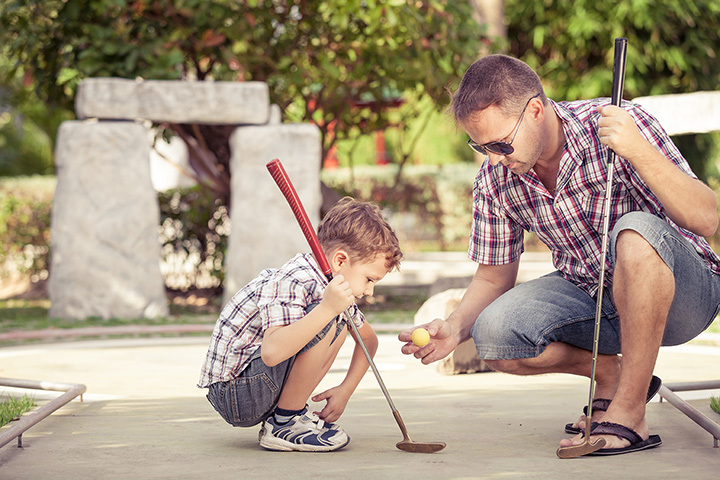 It doesn’t matter if you’re a master putter or not, mini golf offers family-friendly fun for everyone. Whether you’re looking for a day out with the kids or an evening with friends, check out these 10 great mini golf courses in Virginia! The Charlottesville, Virginia Putt-Putt Fun Center offers 18 holes through a variety of obstacles. Whether you’re a serious putt-putter or playing for fun, the Fun Center has something for you. Check their website for regularly announced specials, including the daily 3-game special or 12-game family ticket. Birthday parties are offered at a reduced price. The Magic Putting Place has 36 total holes spread out over two 18-hole courses, with obstacles including a magic castle and saw mill. The landscaping throughout the park is pristine. The 19th hole snack bar offers drinks, chips, and other snacks. Nighttime golfing is lit up by course lighting laid throughout. General admission for 18 holes before 6 PM on weekdays and $4 and $.50 on weekends. Monster Mini Golf in Chantilly, Virginia, is monster themed fun. The park includes a laser maze and mini bowling, in addition to golf. The indoor park is glow-in-the dark with “creatively designed, fun for all ages, animated monsters around every twist and turn.” The monsters are interactive, which will undoubtedly create a memorable experience, especially for younger golfers. Pirates Cove Mini Golf is one of the larger themed mini-golf franchise across the United States, with one location in Williamsburg, Virginia. The golf holes have been designed to take advantage of their elaborate pirate-themed obstacles and props. You’ll golf through caves, over footbridges, and under waterfalls, to name a few options. Jungle Golf has been serving Virginia Beach since 1970 with 18 holes of jungle themed mini-golf down at the Virginia Beach Oceanfront. They are open year-round. Jungle Golf invites you to “take your best shot over the hills, past the water hazard, through the depths of our smoldering volcano!” All while life-size animals overlook the course. Stop by their base camp to grab a drink and snack. The Waynesboro Golf and Games is a straight-forward, 18-hole mini golf course that boasts nice water features, beautiful trees, and well-kept landscaping for a relaxing afternoon. They offer the only Par 3 course in Waynesboro. Avid mini-golfers might consider joining their Captain’s Choice League or 3 Strike League. Weekend golfers, think about coming by for Night Golf. Patterson Sports Park in Richmond, Virginia, has been voted Comcast’s “Best of the City” for their course that is fun, challenging, affordable, and accessible for golfers of all ages. In business for thirty years, Patterson Sports Park now has two mini-golf course with moving obstacles and life-sized animals. Win a free game by shooting into the 19th hole. Buy tickets ahead of time on their website or at the door. Partee’s Blacklight 3D Golf in Chesapeake, Virginia is a black-lit indoor extravaganza. They offer birthday parties for kids as well as parties for adults. Adults interested in hosting events can contact them directly for custom pricing. The interior is space themed, with flying asteroids, glowing planets, and funky aliens lining the walls. Weekly and daily specials are available. For a full listing and details, check their website. The Lucky Duck Miniature Golf Course in Fairfax, Virginia, is part of the Parks and Recreation Department of Fairfax county. The park has a total of 493 acres and includes 55 acres of lakes, wetlands, and streams. The golf course is double holed, with fun obstacles along the way. The price is $4 on weekdays and $5 on weekends with group rates and party packages available. Appleland Sports Complex in Stephens City, Virginia features a 12-hole full course and 18-hole miniature golf course. The obstacles aren’t too complex or difficult, but the scenery more than makes up for it. Prices are reasonable, starting at just $2 for kids under five, and maxing out at $6 for those older than 12. For a nice, relaxing day at the mini-golf course, Appleland has much to offer.